The print on the interior of the tureen is of Hollywell Cottage in Ireland. 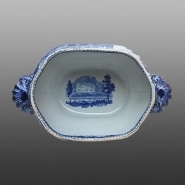 An earthenware sauce tureen printed in blue with a named view of Arundel Castle, Sussex, from the Antique Scenery Series. This series was attributed to Zachariah Boyle on the basis of a platter, impressed BOYLE. Arundel Castle on the River Arun in West Sussex was originally built in 1067 by Roger de Montgomery on land given him for service rendered to William the Conqueror. Over the centuries it was expanded and was owned by various nobles and Kings Henry I and II. For at least 400 years it has been the principal seat of the Dukes of Norfolk. More recently it has served as a "stand in" for Windsor Castle in several movies and TV productions.